Silver Spring, Md. (Tuesday, April 10, 2018) – A short video message from teens to their peers to encourage safe driving habits might be all that is needed to avoid dangerous driving situations. That is the premise behind the Toyota TeenDrive365 Video Challenge, which drew more than 1,300 entries from students across the country. 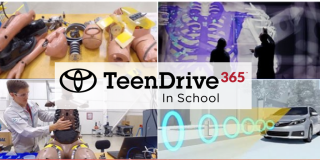 Toyota and Discovery Education invite the public to watch the ten finalist videos at teendrive365inschool.com/teens/video-challengeand VOTE for their favorite winner through April 24, 2018. This year’s top ten finalists come from Colorado, Maryland, Massachusetts, Minnesota, New York, North Carolina, South Carolina, Texas and Utah. · People's Choice prize: $5,000 and a behind-the-scenes trip to a Discovery, Inc. network taping.